I found this gal's blog through Pinterest, and was inspired by her tutorial to make my own rag rug. I liked the chunky braided look of the crocheted scrap rug. I have been collecting and purchasing old bed sheets for the rag rug I have wanted to make for his room over the course of the last year or so. I even bought the large crochet hook I needed to do the job. But I kept making excuses as to why I couldn't start the rug. Really! I had so many other projects to do, and people to visit, and a little boy to chase around, and a family to feed, and blog posts to write, and piano to practice, and time to waste on facebook . . . Ok, I'll admit it - I was mostly just intimidated. Really intimidated. I have never crocheted in my life and so I was really starting from square one with this project. My very first attempt at crochet. It has to be documented somewhere, right? I used a stretchier fabric (instead of bed sheets) for the center round of my rug the second time around. So there is no puckering - it all lays perfectly flat. I made very loose chain and single stitches which made the rug easier and faster to work with. Making sure I was being consistent in where my bed-sheet-yarn was laying when I entered the rug for the single stitches. I got into a pattern of doing one chain stitch and then one single stitch throughout the work, which helped a lot with the unevenness - instead of just winging it as I had the first go around. I ripped the sheets as the blogger instructed in her tutorial, but as I crocheted and got to a point where I wanted a new color, I sewed across the top of old color and new color bed-sheet-yarn nice sides facing each other, and closed the seam up inside the yarn and continued crocheting. The "Knit Witch" video tutorials! I linked the three I used to the bottom of this post if you don't know how to crochet, but are interested in tackling this project yourself. After I got to this point (see picture below) I had to go thrift store hunting to get more bed sheets. Apparently you need a lot of bed sheets to make a huge rug. Approximately 16 to be more exact. Here is the finished rug! I think I may have it wrong side up - but I don't care. I like the way this side looks better. More like a braided rug than a knotty rug. This rug is 60 inches in diameter. It totally brightened up his space. Thanks, Lesly! And yes . . . Send that fabric to me in about another year two after I've recovered from having made this rug. Haha! Wow, that looks great! 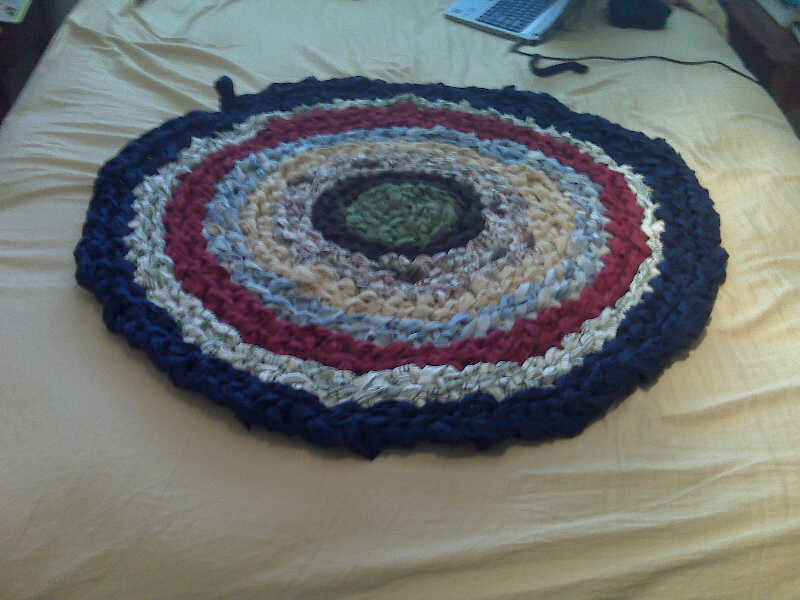 I've done a lot of crocheting, but never a rug. I may have to try this sometime. Thank you, Melanie! If you already know how to crochet - this rug will be a breeze for you! Not to mention it's a pretty cheap way to spruce up a space.